If you exercise aerobically, fartlek training can provide an effective change of pace for your routine. Fartlek training is a form of interval training that allows you to vary the length of your intervals, depending on how you feel. It is an efficient form of training that can condition you for many sports. If you are beginning an exercise program or adding fartlek training to an existing program, consult with your health care provider. Most forms of aerobic exercise feature repetitious movements. Over a period of time, this can cause you to lose interest. Fartlek training allows you to add an endless variety of intervals to your aerobic workouts, which helps to keep you stimulated. For example, if you are a jogger, you could add two minutes of running for every five minutes you jog. 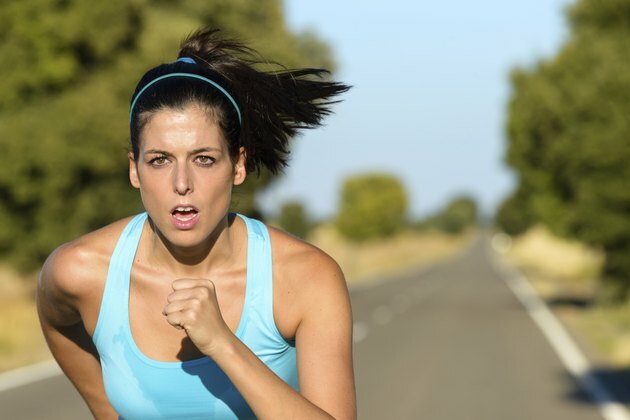 During your next workout, you could add 30 seconds of sprinting, for every six minutes you jog. You could combine all three levels of intensity, by alternating jogging for seven minutes, with running for two minutes, and then sprint for the final 200 yards of your workout. Such sports as basketball, tennis and soccer, require you to exert varying levels of effort and intensity throughout the competition. In a basketball game, for example, you must exert maximum effort while running a fast break, while you exert very little effort while standing at the foul line. In a tennis match, points rarely last a minute and are followed by brief periods of active recovery. Structure your fartlek training to simulate the varying intensities that are required by your sport. According to the website sportsfitnessadvisor, fartlek training for multi-sprint sports should include a 10-minute steady jog for a warmup and a10-minute steady jog for a cooldown. The entire workout should last approximately 30 minutes. In between your warm up and cool down, you should alternate intervals of jogging with sprints of varying intensities. The intervals should last between 10 seconds and one minute. By varying the intensity of your workouts, you will burn more calories than you would by keeping a steady pace. Your workouts become more efficient, because you burn more calories during your workouts without increasing the amount of time devoted to the workout. According to The American Council on Exercise, interval training helps you avoid injuries that are caused by repetitive, aerobic exercise. However, if you are not used to fartlek training, start slowly. Until your body is conditioned for fartlek training, keep your high intensity intervals short and infrequent.